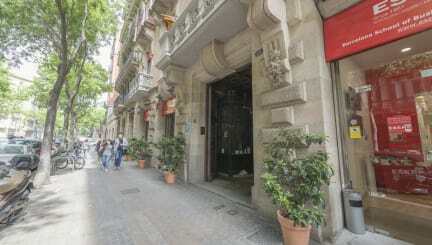 Hostal Girona, Barcelona, Hiszpania : Rezerwuj teraz! 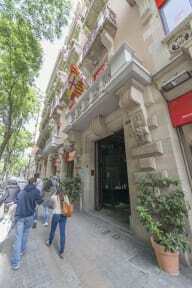 Our B&B is located at “The Eixample Neighborhood”. Which is characterized by long straight streets, a strict grid pattern crossed by wide avenues, and square blocks with chambered corners, in vibrant, artistic, trendy and diverse place, famous for its history and architecture. Our charming rooms are located on the first floor of our 19th century Art Nouveau Building with all its original detail and impressive entrance. You can reach by foot the entire city center while staying in the safe and charming Eixample neighborhood, in the “golden square” of Barcelona. It’s only 300 meters from Plaza Cataluña, the Ramblas and Paseo de Gracia, an ideal position to visit the Gothic Quarter and the Eixample, with the famous Gaudi’s houses (Casa Batlló and La Pedrera) and many other major tourist attractions and main shopping areas. Each room has a full-sized bed, dresser, bedside tables, large closet and original detail as: mosaic floor and high ceilings with moldings. Fresh towels and bed linens will welcome you. The bath and common kitchenette (microwave oven, refrigerator, coffeemaker, and dishware), located on the same floor, are shared with guests from other rooms. Some of them come with shared bathroom or with private. The reception is open up to 24.00.